I try, really I do. But I just have not got the hang of the super-career-woman-yummy-mummy thing. I look at all the lovely ladies in the Twitterati who juggle seventeen kids and running their own business whilst still finding time to keep an immaculate house and find time to have a life too. But that's never going to be me. I'm the mummy who gets stuck at work and then hurtles along the motorway, praying that there won't be any jams because I'm late for teatime. And my darling daughter then repays my efforts at trying to pretend I'm supermum by saying no to her tea before I've even fastened her into her high chair. Abigail made pizza. She fed it to the dogs. Although I was late tonight, I still tried to make an effort. The child will not eat anything other than pasta. And cheese. And peas. And absolutely any kind of fruit you care to throw at her. I'm tired of the GP banging on about how she needs a balanced diet. If only he would come round and witness her bury her head in her hands if I've had the temerity to put a few carrots in amongst the pasta and peas. Or, heaven forbid, that I've given her pasta and cheese with tomato sauce. She was an amazing eater until she learned to say no. Her early cosmopolitan tastes included hummus, patatas bravas, mousakka and spanish omelette with feta to name but a few. But these days she's having none of it. I tried a different tack today. We made pizza. She made the dough. 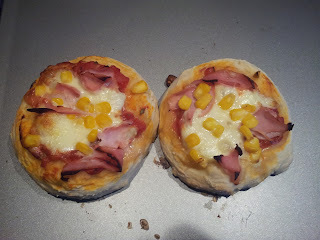 She topped them with ham (which she will eat if it's in her sandwiches I make for nursery, but not at home), sweetcorn and mozarella - she chose the things from a bowl (and ate all the pineapple before it got anywhere near the pizza). She waved it into the oven. She watched it like a hawk while it cooked. She chanted 'Mama tea' while it cooled. Her backside had barely touched the high chair when she adamantly said 'No Mama' and buried her head in her hands for the next five minutes. Well the dogs enjoyed them anyway. And I'm sure it's a great recipe for those of you with kids. It's from the M&S Just 4 Kids book which is a great little book full of recipes that both kids and adults can eat - provided their not fussy like what my family is! Will post the recipe later as the book's downstairs and the husband is currently crashing round the kitchen, filling the dishwasher. I intend to steer well clear!